YOU ARE A DRAGON. Like all respectable dragons you must find yourself a princess and hoard some treasure. There are nearby towns just ripe for the plunder, ready to be razed with your dragonflame until they submit and hand over their riches. But you're not the only Dragon out there! 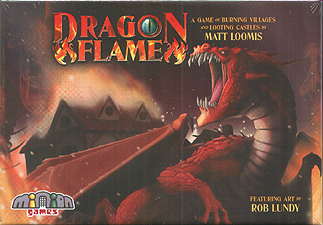 In DragonFlame, you take turns creating piles of valuables for scoring. You must carefully decide whether to choose from safe face-up treasures for your hoard, or risk the potentially perilous piles seeded with face-down threats like curses, knights, or counterfeit riches! Or you can focus on burning hapless villages to the ground for more glory! Only the cleverest dragon will become a legend.